Earlier this week, the NYCLU released a report on NYPD stop and frisks. The report prompted Public Advocate (and likely mayoral candidate) Bill de Blasio to call for an internal audit of the program. Other politicians, including Jumaane Williams, Christine Quinn, Scott Stringer, and John Liu have also called for stop and frisk reform. Mayor Michael Bloomberg and Police Commissioner Ray Kelly have continued to defend the use of the program from criticism, saying it saves lives. Here are 15 shocking facts about NYPD stop and frisks. 1. 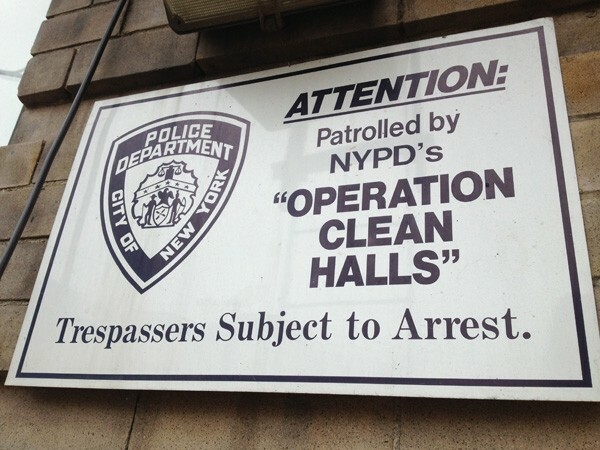 "In Brownsville, Brooklyn In 2009, 93 Out Of Every 100 Residents Were Stopped By The NYPD"
"Operation Clean Halls," has been in effect since 1991. As Matt Taibbi describes, "it allows police to execute so-called "vertical patrols" by going up into private buildings and conducting stop-and-frisk searches in hallways –- with the landlord’s permission." The NYPD conducted 240,000 vertical patrols in 2003, and according to the NYCLU -- who has filed a lawsuit against the police department regarding Clean Halls -- "virtually every private apartment building [in the Bronx] is enrolled in the program," and "in Manhattan alone, there are at least 3,895 Clean Halls Buildings." 87 percent of those stopped by the NYPD in 2011 were black or latino. Since 2003, after Mayor Bloomberg took office, NYPD stop and frisks have increased 600 percent. In 2011, a record 684, 330 stops were conducted by New York City police officers. In the first three months of 2012, the NYPD stopped and frisked people 203,500 times. In the same three months last year, the NYPD stopped people 183,326 times. The Taxi/Livery Inspection Program (TRIP), was designed to prevent livery cab drivers from being robbed. Livery cabs who engaged in the program had placards that allowed the NYPD to pull over the car and search the vehicle. NYPD officers would often frisk the passengers inside. After a lawsuit filed by the NYCLU last year, however, Ray Kelly has ordered cops to stop enforcing the program. The NYPD operational order, issued on April 27, is a direct result of a lawsuit filed by two men who say they were forced out of livery cars and searched by cops, police sources said. In separate incidents, both men accused police of racial profiling and unlawful searches. The NYPD argues this shows the effectiveness of stop and frisk, saying the practice has prevented people from carrying guns on the street. The NYPD and local politicians have repeatedly defended the racial disparity in stops by saying minorities are disproportionately involved in violent crime. In 2011, however, in only 10.5 percent of stops did cops record "violent criminal activity" as justification for the stop. Also, for visible bulges in your pocket. And, in 51.3 percent of the stops in 2011, cops cited "furtive movements" as justification for the stops. Nearly 150,000 stops over the last six years are facially unconstitutional and lack any legal justification. All together, 30 percent of all stops are unconstitutional, underlining a severe lack of adequate officer oversight in the NYPD. Nine out of 10 of those stopped in 2011 were neither arrested nor given summonses. The NYPD and politicians have repeatedly justified the racial disparity in stop and frisks saying that they cops essentially go where the guns are, i.e. minority neighborhoods. Yet, only 1.9 percent of frisks in 2011 turned up weapons and interestingly, according to the NYCLU, "a weapon was found in only 1.8 percent of blacks and Latinos frisked, as compared to a weapon being found in 3.8 percent of whites frisked." In the month of January alone, more than three dozen lawsuits alleging improper stop-and-frisks were filed, based on a Voice reading of the complaints. Extrapolated, that means that the city could be sued more than 400 times this year alone just on improper stops.